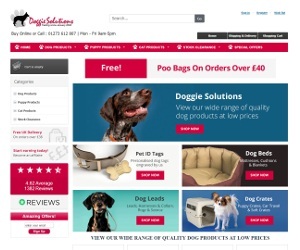 Doggie solutions, as the name suggests, is the one stop shop for dog products. Their product range includes Dog Crates, Dog Beds, Toys, Collars and Puppy Cages to name just a few. Trading since 2003, this dog specialist has carved a name for itself as being a reliable source of dog gifts for many years. As a specialist they have been able to offer an ever expanding product aimed at a very specific target demographic, dogs!